The Evidence-Based Model of School Funding and the Every Student Succeeds Act (ESSA) have made waves in the way education is funded and the way expenditures will be reported by school districts. Take advantage of the resources and events below to stay in the know on the impact of these two pieces of legislation. On August 31, 2017, Governor Bruce Rauner signed SB 1947, enacting a new evidence-based school funding formula into law. The resources and events below provide guidance on how this law impacts your district. School districts received the first of 22 Evidence-Based Funding (EBF) payments for fiscal year 2019 on Aug. 10. This represents both the Base Funding Minimum (BFM) amount, often referred to as the hold harmless provision, and tier funding amounts newly calculated for FY 2019. Per statute, the Base Funding Minimum amount grows annually by the amount of tier funding paid in the prior year and the additional English Learner funding from FY 2018. In FY 2019, the BFM consists of three components – the FY 2018 BFM amount, the FY 2018 tier funding amount, and the FY 2018 additional English Learner funding. In addition to the BFM, districts receive an additional $300 million in funding distributed through the tiers, with the greatest share of funding going to those districts with the greatest need for assistance. Beginning in FY 2019, there is also $50 million reserved for a new property tax relief grant program. More details about this grant will be available in the weeks ahead. Any funds not used for tax relief grants will be available as additional tier distribution amounts in the spring. EBF payments will continue on the 10th and 20th of each month through June. Full FY 2019 calculations are available at the EBF Distribution page. Executive Director, Dr. Michael Jacoby (IASBO) and Superintendent Gary Tipsord, LeRoy CUSD #2 (IASA) have worked with the Illinois Principals Association to develop a series of Evidence Based Funding Model tutorial videos to help answer your questions. ​The Evidence Based Funding for Student Success Act prioritizes distribution of new funding to the students with the most need and the most poorly funded school districts. 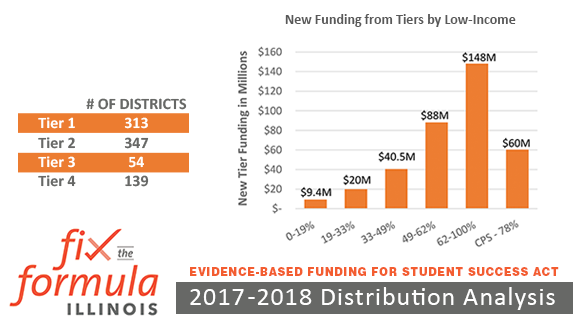 The calculations released April 5 by the Illinois State Board of Education confirm that the new formula provides a roadmap to adequacy and effectively distributes $366 million in new funding for the 2017-2018 school year. Get informed about all the elements of the new funding model in this feature article from the Journal of School Business Management. See the Statewide School Management Alliance's analysis and quick view guides of the bill, as well as an overview of the new formula. Access explanatory documents, data sheets and more related to evidence-based funding. Due to a need for data on a school-level basis to comply with ESSA, ISBE is currently working on a new data collection mechanism. Collecting the necessary data to input in this form will require more school district reporting processes. Illinois ASBO has been represented by Executive Director/CEO Dr. Michael Jacoby, Past President Susan Harkin and Treasurer Dr. Dean Romano on an advisory committee has been formed to help ISBE with the process. Watch this new page on ISBE's website devoted to site-based expenditure reporting for the latest updates! See the guidance document from ISBE released on January 30, 2018! Download a Suggested District Implementation Timeline. 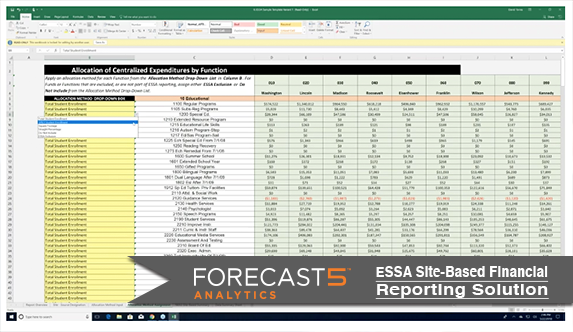 Join Dr. Michael Jacoby and David Torres of Forecast5 Analytics for a webinar to review the ESSA site-level expenditure reporting requirements. As a member of the ISBE advisory committee on this issue, Dr. Jacoby offers his guidance to help districts meet this new requirement. This webinar previews a Forecast5 tool that allows for quick disaggregation of general ledger data to create an automated report that will meet ESSA reporting requirements in the prescribed ISBE format. What should you be doing now to prepare for site-based expenditure reporting under the Every Student Succeeds Act (ESSA) at the end of FY 2019? 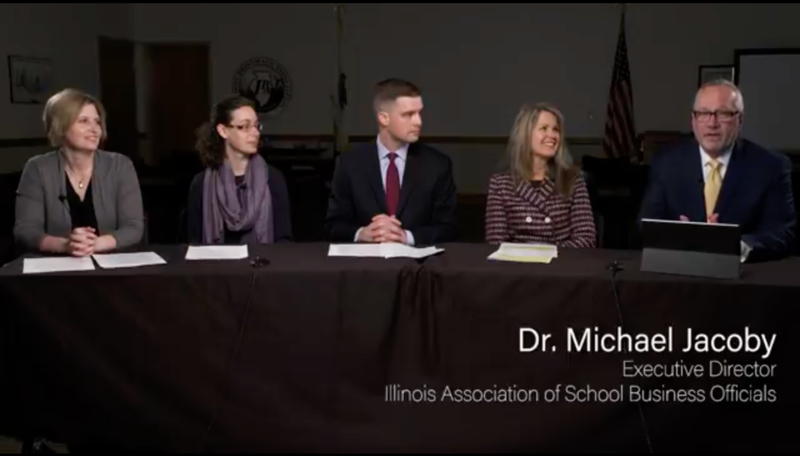 The latest of three video updates (published May 1, 2018) on the issues features a panel discussion including Illinois ASBO Executive Director/CEO Michael A. Jacoby, Ed.D., SFO, CAE, along with Susan L. Harkin, Chief Operating Officer at Comm. Unit Sch. Dist. 300, Michael J. Duback, Dir./Operations, CSBO at LaGrange Highlands SD 106, Sara R. Shaw, Senior Manager of Fiscal & Academic Solvency at Illinois State Board of Education, Carrie Stewart, Managing Director at Afton Partners. Get a recap on the ESSA legislation, an update on the work of the advisory committee as well as what your district can be doing right now to prepare for implementation in terms of data reporting processes and communication.